Congo - The Secret of Zinj is an unreleased Super NES game based on the hit 1995 movie. The game was cancelled after a short development turnover and playtests indicating that the game was not good enough for release. Also contributing was the fact that the movie was a bit of a flop. A ROM image of this game exists, released by Martin at NESWorld. I remember watching the movie Congo in theatres when I was a kid. I recall it was a silly movie about this group of treasure hunters searching for this lost city of Solomon, which had giant diamonds. I do not remember all the details, but it featured these giant apes attacking the protagonists, while at the end, the apes perished by jumping into erupting lava. It certainly was not a great movie, but it had quite a bit of hype. furor: That list brought back some horrible memories. 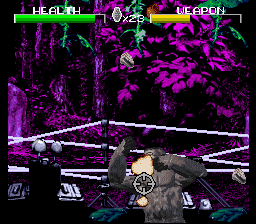 I almost forgot that a SNES version of Congo even existed. I worked over at Viacom and actually got to play it some. The game sucked so bad that we cancelled it. So, I know for a fact that it was never released. hydr0x: Hey furor that's GREAT info, thanks a lot, do you know if there are any protos left? Any screenshots? any Viacom-papers about it? Oh and tell me more about it, what kind of game was it? furor: No protos, screen shots, or info on the game that I know of. All I can tell you about the game is that is was a pretty bad rip off of Donkey Kong Country. 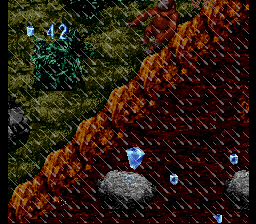 It was a side scroller where you controlled a poorly animated gorilla picking up diamonds instead of banana's. any info to satisfy my curiosity? Thanks! take as a good sign...believe me, the 16-bit Congo was a travesty! That might have been the last we heard about the game, were it not for a moment of serendipity by Martin of NESWorld. While looking for information on the unreleased NES game, Congo's Caper, he stumbled onto a webpage by one of the developers of Congo for the SNES. Martin asked him if he had worked on Congo's Caper, but instead found that the developer had worked on another unreleased game, based on the movie Congo. After some conversations, the developer sent a prototype of the game to Martin, and wrote a lengthy article on the development of the game. During the final two weeks, we were exhausted. Viacom had begun to QC the product in preparation for Nintendo’s and Sega’s more rigorous testing processes. They came back with fewer and fewer bugs. August 7, Final Day, rolled around. The customer expected the binary uploaded to their server by Midnight. That evening, my boss asked me if I needed anything from him. I told him I was fine. He confided to me that he thought Congo was in the top 20% of games out there quality-wise. Most of those games had a year or more of development time; ours had five months. I performed a few last-minute, minor changes, added the signature bytes, and created a build, which we then uploaded. We were done, just waiting for their QC process. And waiting… And waiting yet more.... Another day passed, and on the second day after the upload, we got a call saying their QC had found a bug and that we would not get our bonus. The bug was a shift in palette colors that happened if the user moved from the title screen to the game menu, back to the title screen, and back to the game menu. It was a legitimate bug, a bug they may have, in fact, caught earlier and not informed us, knowing they could take our bonus in this way… This is only a theory. However, despite this, Congo was finished, on time and on budget, and the team felt absolutely great. Most left for much needed two-week vacations after that. They returned to find that Viacom, acting on data in the film industry reflecting poorly on the movie Congo, had cancelled the project. The foundations of our beings shook. We had just been told that immeasurable labor, passion, sacrifice, and stress, in short, fourteen months of our lives had been wasted. For some of us, this was the most devastating day in our careers. In essence, the development of Congo lasted for 14 months, though the initial nine months of work was scrapped after deadlines and comments from Viacom forced the restart. The story of the development of Congo was rather tragic, and certainly sapped the energy of the developer who wrote the article for NESWorld. Still, the results in the five months of development are quite impressive. However, I have to disagree with the assessment that this game would be in the "top 20% of games out there quality-wise"
Congo is an interesting game, because it is split into five different types of gameplay. The main levels include a light-gun style shooter, a raft level that is sort of a "avoid the edges" maze game, a slide level where the character must jump to avoid spikes and other obstacles, an on-the-rails platform level, and an overhead 2.5D level. There is a lot of variety in this game, and some of the levels work. A lot of the flaws probably could have been ironed out with additional development time. The main issue with this game, in particular in the non-shooter levels, is that your character dies in one hit. This makes the game rather frustrating in parts. I will go into this later in the article. Controlling light-gun style shooters with the D-pad is always awkward, but those particular levels are not too hard anyways. The other levels feature collect-o-thon gameplay, though it is downright impossible to collect all the diamonds in the level because of forced scrolling. In some of the levels, the graphics and sound are top-notch. The raft levels in particular really show off some great water effects. The 2.5D platform level is also excellent, and I cannot recall any game for the SNES that was able to implement this particular viewpoint. The graphics in the slide level are not as impressive, and there are problems with clipping. 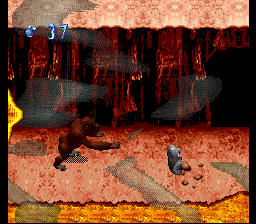 The shooting levels are typical of light gun games such as Lethal Enforcers, with decent animation for the gorilla enemies. As for the other levels, aside from some boulders and hippos, there are not any enemies to deal with. The developer who wrote the article was not lying when he said the lava that follows you on the last platforming level was thrown in at the last minute - it looks terrible and follows the screen rather than the level obstacles. Between levels, there are some decent digitized stills of events in the movie. The music in the game involves jungle-beats, and are very appropriate for the game. There aren't many sound effects except for when you die and when you pick up diamonds. The first real stage in the game features your character (Captain Munro Kelly?) rafting down a river. The stage is split into two levels plus a bonus level between them. 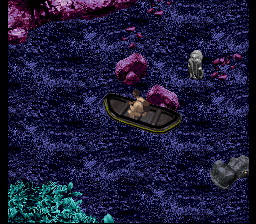 The controls for this stage are fairly dicey, though you can generally slow your raft down to a crawl by pressing the opposite way of your motion. One of the most frustrating parts is the fact that you cannot go backwards, meaning if you missed a secret passage, it is impossible to go back and get it. Speaking of secret passages (generally marked with five rotating diamonds), if you fail to find them, it makes the stage much more difficult. Much of the latter parts of the first level are narrow passages lined with spikes or trees. One bad move and your life is over. If your character had three or four health points, this stage would likely be very easy. Due to the one-hit deaths, this stage is quite awkward and downright frustrating at times. The second level features hippos that are fairly well hidden until you get near them (you can tell where they are because the water is darker). Most of the hippos are fairly easy to avoid, but some of them come after you near the end of the level. The floating logs serve as the largest obstacle in the stage, and can be pretty dicey to avoid in narrow areas. With practise, the stage is very beatable, though. Die, you damned, dirty ape! There are several light-gun style shooting levels in this game. For the most part, they involve shooting at gorillas that throw giant rocks at you, or these strange urn-like things that shoot these energy balls at you. For weapons, you are given a collection of 20 grenades and a black orb gun, which has a rechargeable energy bar that controls how fast the gun shoots. The levels are not that difficult, provided that you collect all the health powerups (by shooting at the yellow containers) and destroy all the projectiles thrown your way. The action on the screen is quite hectic. These stages are the only levels with a health bar, which makes passing these levels much easier than the other stages in the game. I passed all three levels in my first or second try. Clipping problems aplenty in this level, which will leave you cursing. Without a doubt, the gorilla slide level is the hardest and most frustrating level in the game. I was never able to even reach the first checkpoint in this level. The problem arises from the fact that the ape slides down the chutes at a fast rate, and it is difficult to react to obstacles quickly enough. Though you can jump over spikes and boulders, there is no way to slow yourself down to track which paths to take. Again, with one hit deaths, the level becomes very difficult. 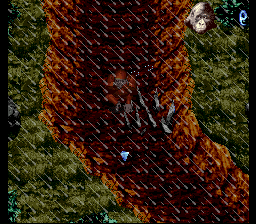 There are some clipping issues in this level, and sometimes the gorilla can veer way off the actual course. The developer who wrote the article on NESWorld stated that this level was supposed to have the character (Karen) riding some sort of skateboard-like platform. And really, the gameplay of this level is pretty much the same as the first mine cart level in Donkey Kong Country. 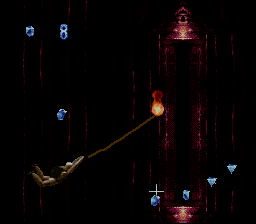 In this level, the primary gameplay mechanism is simply to press the jump button at the right time, and occasionally using the whip to cross gaps. Much like the mudslide level, there is no way to slow down your character, and sometime it almost feels like pure luck to avoid smacking right into a pillar or missing a gap. Still, with practise (and a bit of memorization), this level (again split up into two sub-levels and a bonus level between) is beatable. This level might be fun for twitch gamers, but the on-the-rails component makes it rather dull. Swing like Indy! Too bad this level is on-the-rails rather than an action platformer using the whip. There is a secret level near the start if you fall at the right spot. Can you find it? When the former Viacom employee mentioned that the game was a "rip off of Donkey Kong Country", he must have been referring to this level. However, aside from the similarities in the graphics and animation of the gorilla character, there aren't too many similarities. This level has an interesting point of view with an angled overhead camera angle. In some ways it might be comparable to the gameplay in Sonic 3D Blast. The lava that was added in as an afterthought looks terrible and tacked on. 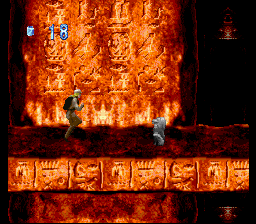 As far as controls, they work well, though the platforming requires a lot of precision, and it is not always easy to anticipate the pools of lava or falling statues before you make a jump. Perhaps the biggest flaw I came across in this level is due to the forced scrolling. You often have to make pinpoint accurate jumps on these pillars to get over a large wall. However, because the screen scrolls too fast, you only have one chance to do this. Even worse, there is a part of the first stage where you have to hit three tiles in the correct order, but the forced scrolling often cuts off the second tile you hit before you get a chance to step on it. Again, there are issues with one-hit deaths. Because of these issues, it is highly unlikely most people will have the patience to actually beat the level. This cheesy lava follows you as the level auto-scrolls. 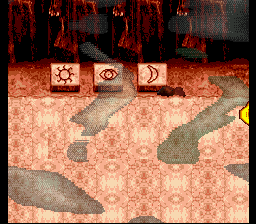 Expect to die if you get to this tile puzzle, as the screen auto-scrolls too fast to finish it most of the time. If the code is entered correctly, the lives number is mirrored. If you really want to delve into some of the more frustrating stages, enter the following code at the title screen: L, R, X, L, R, X. This code gives you twenty lives and five continues when you start the game, and also mirrors the lives counter. Of course, continues are rather pointless in this game, because if you lose your lives and continue, you restart from the very beginning of the level, making it no different than re-entering the level passwords. To reset the game while playing, simultaneously press L+R+Start+Select. Congo is an impressive game if you consider that it was developed in five months. However, despite the fact this game is bug-free, it lacks the polish of a completed game. Extensive playtesting probably would have revealed the need for a life bar on the raft and mudslide levels, the need of a method to slow down in the mudslide and cave run levels, and to slow down the forced scrolling in the final platform level. The graphics in many of the levels are great, while bland in others. Collecting diamonds is a downplayed gameplay aspect compared to most collect-o-thons, mostly due to the fact you cannot retrace your steps. Congo could have been a great game, but in its final state it is not polished enough to justify the claim that it was a top tier SNES game. Download the ROM image here.